If you live in the United States and think about the adults you know, you’ll probably find that the vast majority of them are taking at least one pharmaceutical drug. Many take much more than that. What a recent study published by the Centers for Disease Control (CDC) has found is that Americans consume twice as many opioid pain relievers as the next highest nation (Canada) and more than any other country in the world . 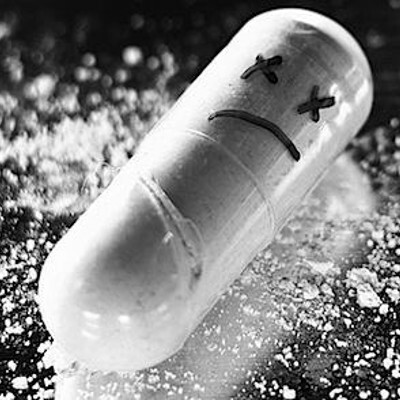 Opioids are morphine-like and create a high in the user (e.g., Percodan, Demerol). They can be addictive and once the body becomes tolerant of the current dose, more of the drug is needed to achieve the desired effect. 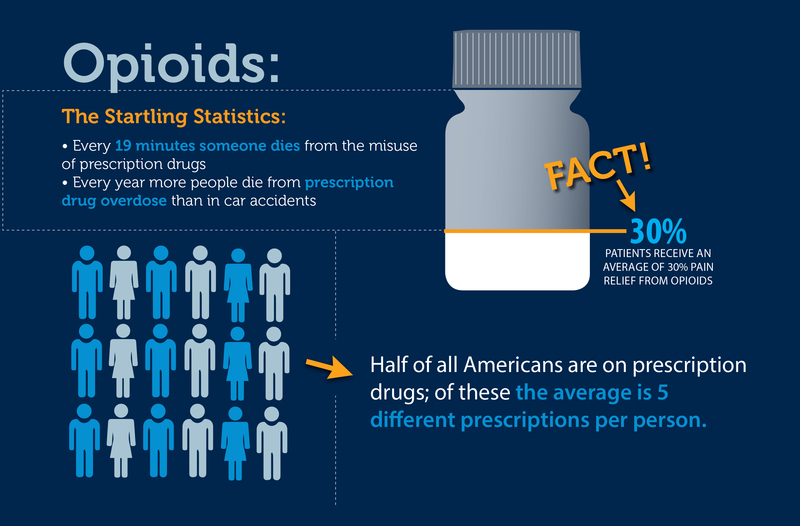 Because of these factors, abuse of opioids is much more likely than other pain relievers. 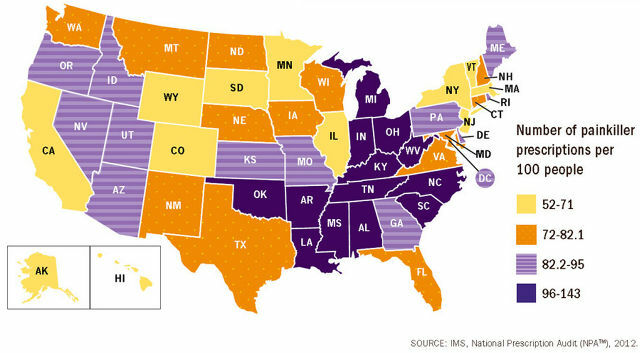 The study found the swath of states from Michigan south to Louisiana, and Oklahoma east to North Carolina to be the origin of more prescriptions for this kind of painkiller and all pharmaceuticals in general than elsewhere in the country: 96-143 prescriptions per 100 people. Overdoses from prescription medications account for 75 percent of all drug overdoses and by 2010 had tripled from those in the 20 years previous . The numbers have been consistently increasing since 1990. The prescription of opioids for military personnel returning from combat rates at 15 percent. Of those in a study of 2597 subjects, 5.6 percent reported no pain, 38.5 percent mild pain, and 37.7 percent moderate pain . 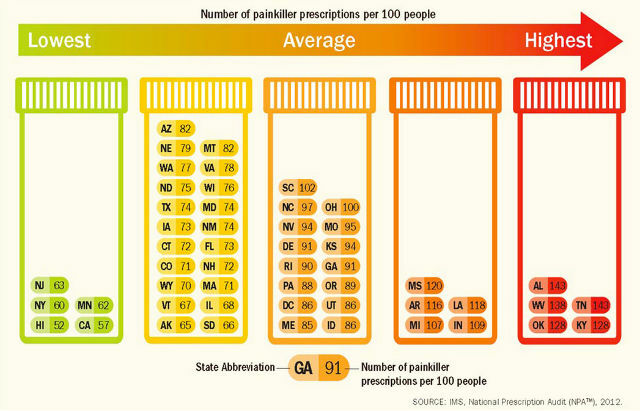 Makes you wonder why such strong painkillers are needed if the pain level isn’t severe. Here’s some perspective: there were 3.85 billion prescriptions filled in 2013. In 1998, the number of prescriptions was 2.5 billion. The numbers increase every year, including those for opioids–staggering. One study published in the Annals of Family Medicine concluded that the increase in total drug costs in the U.S. is due to a greater number of prescriptions rather than per-drug cost. Prescribing patterns have changed over the years, especially for patients under Medicaid . This trend is not one we would like to see persist. Concern for the cost and potential misuse of prescribed medications caused the government of New York to require the serialized recording of all prescriptions; the prescription rate immediately fell drastically. Maybe this is the model for other states to follow. Get your hand out of that cookie jar.